Zonx incorporated the features of this add-on into FetishNightfall v10.9. No longer any need to download and install it yourself. Copy the two .xml files into your FetishNightfall folder and overwrite the existing files. 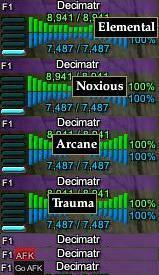 The FetishNightfall Player window allows healers and others with cure spells to click the detremental effects below their name to cure themselves. Unfortunately, this doesn't work for potions. Until now. This mod to the FetishNightfall Player window separates the Trauma, Arcane, Noxious, and Elemental effects into four clickable buttons. These buttons will try and cast the appropriate cure spells first. If the spells are unavailable (for example, your class doesn't have them), it will try and cast the appropriate cure potion in the following order: Grandmaster's ___ Remedy, Expert's ___ Remedy, Dedicated ___ Remedy. If your class has a cure spell that can cure it and is available to be cast, the potions will not be used. Now includes an AFK toggle button/indicator in the top left of the player window right next to F1. Put your cursor over the area next to F1 to see the text Go AFK. Click there and you will go AFK and the text will change to AFK with a red background. Click there again to return from AFK. You can still go AFK using any other method you choose and the indicator will toggle accordingly. At least for me, this should help me remember to clear my AFK tag when I come back from AFK. eq2ui_mainhud_player - Copy.xml - The original file from FetishNightfall v10.8. The "- Copy" is there in case you want to revert back to the original version contained within FetishNightfall v10.8 without wanting to dig up the .Zip file. NOTE: This is a modification to the Player window in FetishNightfall v10.8. If Zonx changes how the Player window works with any newer version of Fetish, this will need to be adjusted in order to get the new features. Also, as always, Zonx can feel free to grab this and include it in any way he sees fit with any newer version of Fetish. Thanks to lordebon and gm9 for the info they posted in the forums that was instrumental in me figuring out how to do this and to Zonx for putting out such a great UI. Also, thanks to Gedron for pointing out the AFK feature in Profit and requesting that I add a similar feature. This will make my life easier. I have been looking for a way to do this and so happy it is still fetish style.